In those days I was thinking about the mechanism of vibration in cell phones and wondered how it worked. I had no idea. So, I searched a little with Google. Basically, the mechanism that causes the vibration is a normal engine which is attached to an eccentric weight. When the motor spins, the eccentric weight causes a vibration. Looking on the online robot shops I’ve seen that are sold the vibration motors. 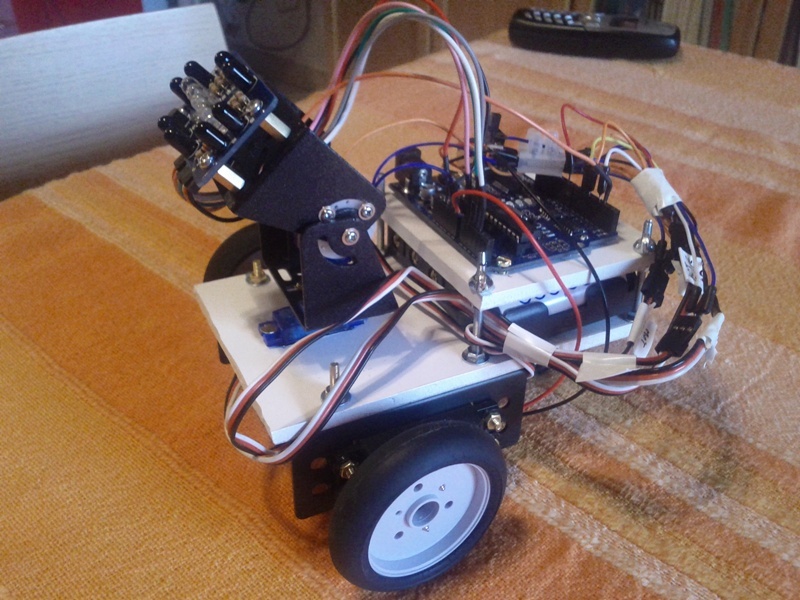 Then I said to myself: why not build a simple robot with a nice vibration motor? And so I tried to think of something original and super cheap. I went into the shop of my friends Chinese to make me some inspiration, and I found something very very nice: a vibrating massager. 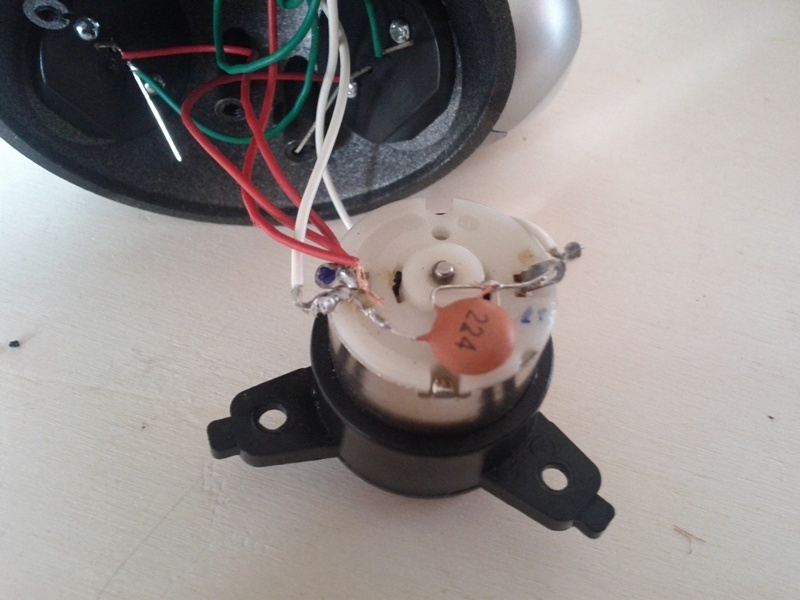 So what happen if I put together a vibrating motor and a shoe brush? First of all, I need something to hold the motor and the batteries on the brush. I used a generous splash of hot glue. Basically what is it? 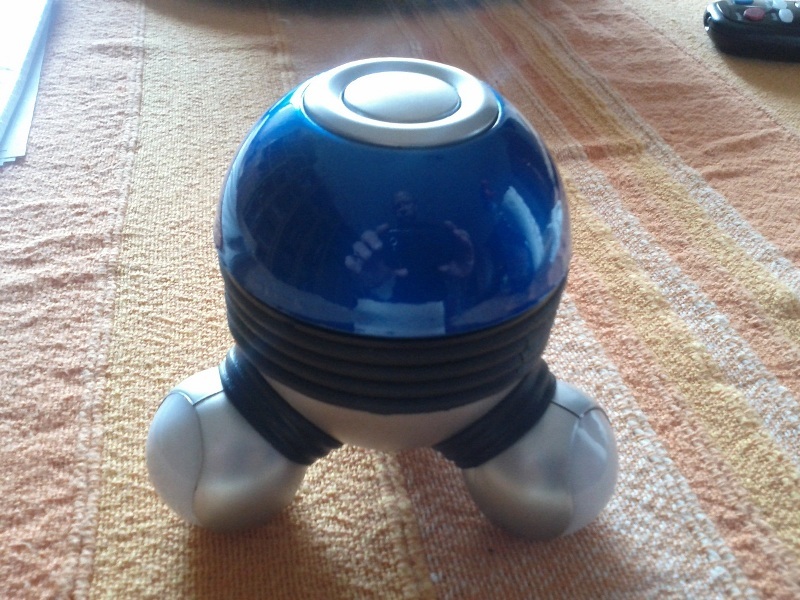 There is a mini massager, properly disassembled and ‘turned’ upside down. 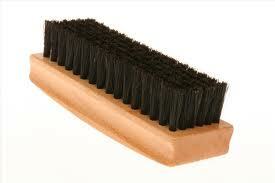 There is the vibrating motor placed upon the brush and the brush itself. 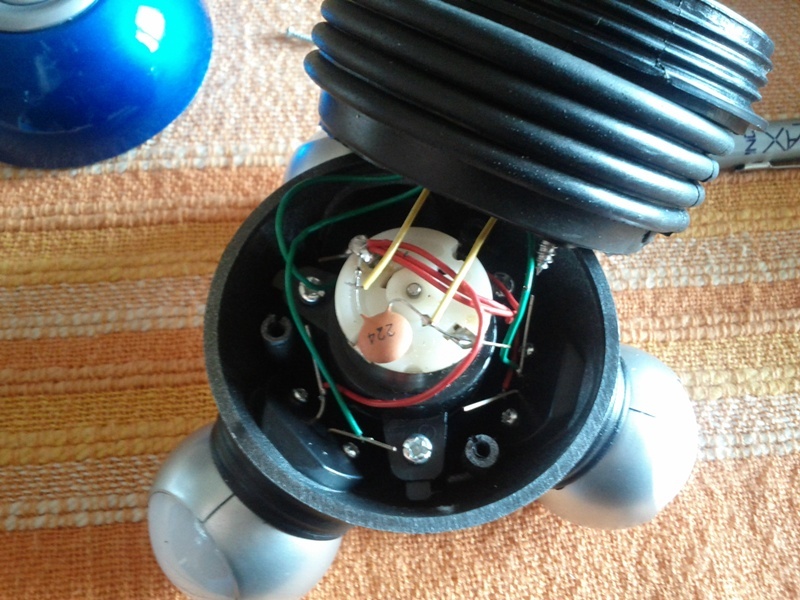 You can see the motor connected to the eccentric shaft which causes the vibration. 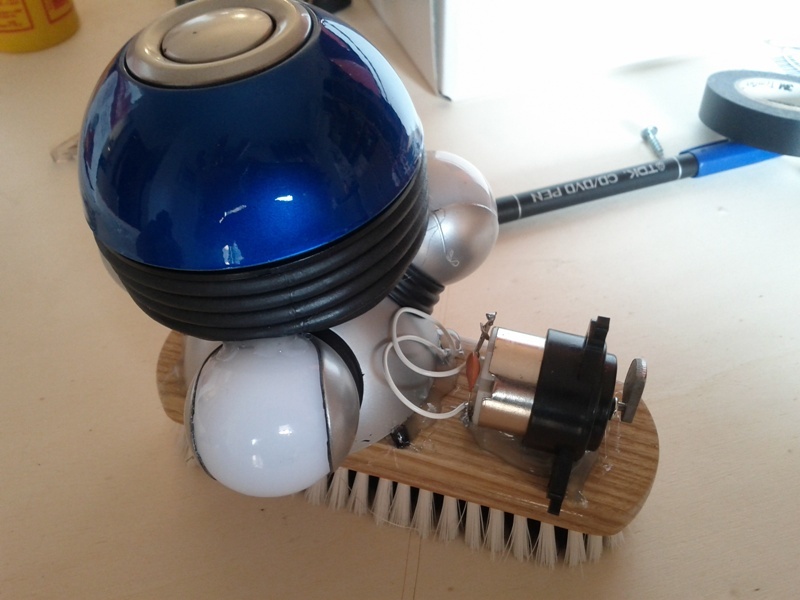 The idea is to make a little robot where the brush, vibrating, almost ‘suspended’ on the bristles, moving around the house. Of course it needs a smooth floor to slide well. As the bristles are not perfect (the brush was a bit deteriorated on one side) and since the motor always runs on the same side, the brush turns always on the same side, but with a new brush I am convinced that could be better. The robot is cheaper than 10 euros all inclusive. In addition, it costs about 1 hour of work and it is affordable for everyone, absolutely everyone. Building a robot with wheels or with legs needs a design completly different. One of the biggest difference is the type and number of motors. While for a robot with wheels usually 2 or 4 servos or gear motors are enough, when we speak about a robot with legs, the number of motors increases dramatically. It is not uncommon to see a hexapod robot with 18 servos. 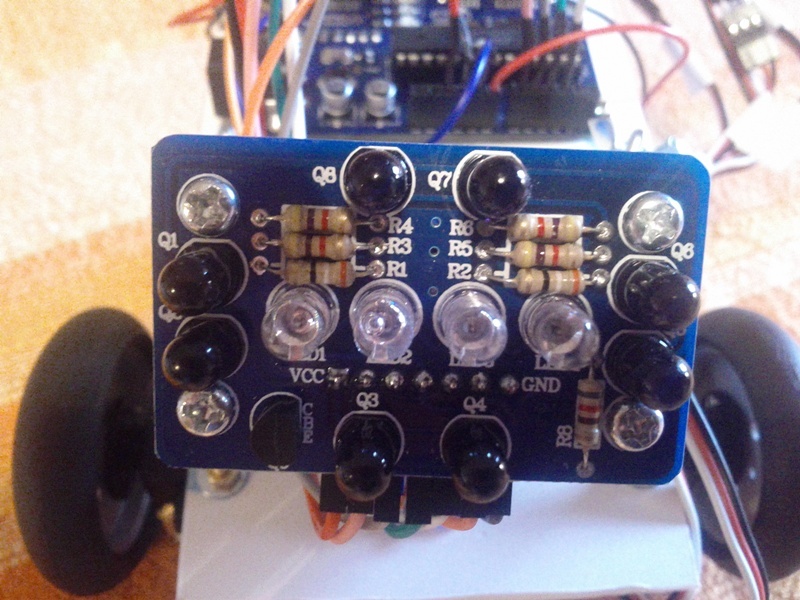 A quadrapod robot has usually 8 or 12 servos, depending on the number of joints. Luckily, compared to robot with wheels, usually are not required servomotors with continuous rotation or gearmotors. Standard servos (0-180 degrees) are enough. Servomotors are driven with PWM and Arduino 2009 or Arduino Uno have 6 PWM pin. And this is a problem. And if you want to use also other sensors using digital pins, the situation is not good, because the Arduino’s digital pins are only 14, and 2 of wich are used for the serial port communication (pin 0 and 1). 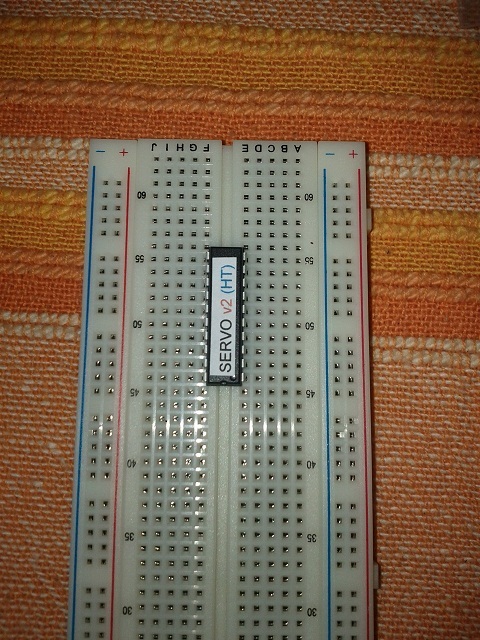 It is possible to use the Arduino Mega, with 14 PWM pin, but it is very expensive (50 euros and more). Searching in internet, I found a low cost chip, using I2C protocol that can drive 12 servos. First good news, the I2C protocol uses only the analog pins 4 and 5. Second good news is that you can use up to 8 chip, so it is possible to drive up to 8×12=96 servos with only 2 analog pins, the 4 and 5. Third good news is that the chip costs about 4 euros and half. A price that can be accepted by every robot builder. SDA, SLC are pins I2C that are connected to Arduino’s pins 4 and 5 and also connected to the Arduino +5 V using the pull-up resistors. The value is between 1K and 10K Ohm (I used the 3.3k Ohm). 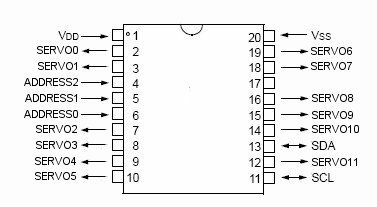 Address1, 2, 3 are the pins that you can use to change the I2C address of the chip(usually not needed, unless you uses more than one chip, in this case it is necessary to differentiate the addresses). SERVO01 … SERVO11 are pins connected to the control pin of the servos (the others are connected to +5 V and GND). I did a test and I think it works fine. This is the code used in the video.